First, I won 3 awards at The Flair Awards, including “Designer of the Year”! Second, Amber Greasley won Miss World Australia wearing my white couture evening gown! It all started when Zoi Condoleon, a Brisbane stylist, asked if I’d like to create a dress for Amber for the Miss World Australia final. Zoi thought this was a great opportunity for Brisbane designers to promote their work to a bigger audience. I accepted the offer, though not without some reservations – as I needed to deliver it in less than three weeks! But I was ready to put in the hard yard, and boy I am glad I did. It was a pleasure meeting Amber, a fresh, bubbly and beautiful 18-year old who was pleased that I had agreed to make her dress. Amber’s dress should be beautiful, elegant and classy, and it should also have my signature aesthetics. I decided on white which suits Amber’s skin tone, with a v-shaped strapless bodice, and hand sewn detailing of beaded lace, pleating and ruchings throughout. A side split would show off her long legs, and the flowy chiffon would sway gracefully as she glides on stage like a goddess. The hourglass shape of the dress would also emphasise Amber’s curves. We had a few fittings to get the fit and design just perfect. I paid attention to the smallest details to ensure all the workmanship, hand draping and couture works are done to my very best. I was mentored by ex-couturier Kerry Xynias throughout the entire process. She told me once that if clients cannot appreciate the work, or want a couture dress for nothing, send them off to buy a off-the-rack dress. Because couture takes time and great details there’s nothing worse than an ill-fitted, badly made, unflattering dress. I couldn’t agree more. The 3 weeks timeline was a huge challenge for me. 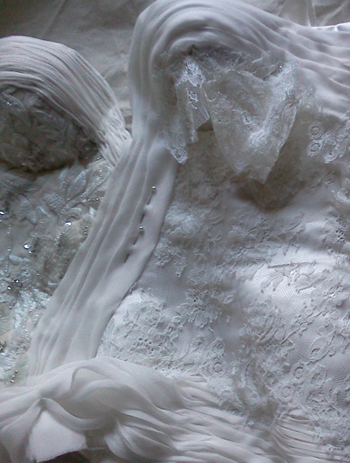 For days, I worked off the mannequin with a variety of laces, silks, chiffons, organzas. Then I repeatedly reworked them, pinned them on, changed the arrangement, styled them over and over again until I got the perfect balance. This process was important as the surface draping greatly effects the entire proportion and sillouette of the gown. After 3 weeks of hand sewing and sleep deprevation, I was finally finished! The end result was a beautiful couture gown that I was very proud off. Amber was happy too and left the last fitting with a big smile on her face. The Saturday of the contest came and I was down in Taree, NSW at the Flair Awards, receiving 3 awards, including the prestigious “Designer of the Year” 2011. My world was just, well perfect! I remember thinking, it just doesn’t get better than this. That night, both of us were on the top of the world. Amber Greasley was “Miss World Austarlia 2011″. And me, Flair “Designer of the Year 2011″, AND designer and creator of Miss World Australia’s winning gown. To see my white evening gown on TV everywhere was surreal to say the least. My friend called me yesterday to say that she just saw my white gown on “Fashion TV”, on the giant screen in Sydney city centre! It just doesn’t get any better than this, does it?! This entry was posted in Uncategorized and tagged Amber Greasley, Awards, couture, gown, Miss World Australia. Bookmark the permalink. For Made-to-Measure consultations and all other enquiries please use the contact form to get in touch.